Cristian Ledesma is a footballer who plays as a midfielder for Serie A club Lazio. A dual citizen of Argentina and Italy, he represents the latter at international level since November 2010. Ledesma is a deep lying central midfielder with a powerful shot with either foot, and occasionally scores goals from long range. On 23 August, Ledesma signed a new contract with Lazio, tying him to the club for another five years (until 2015). In his 2010–11 campaign, he was one of the protagonists of Lazio's surprising start that led the Rome club to even top the Serie A table for a few weeks between October and November. Lazio ended their 2011–12 season campaign qualifying once again for Europa League and only just missing out to Udinese by goal difference in a Champions League spot. Ledesma has picked up where he left from to be the playmaker of Lazio's 2012–13 season campaign where they hope to challenge for a Champions League qualification. Under new Lazio coach Vladimir Petkovic, Ledesma plays a more defensive role in a 4–1–4–1 formation where he sits in front of the defence and dictates the play. On May 26th 2013 he wins his second Coppa Italia and Lazio's sixth beating Roma 1-0 in an historic derby, the first ever to assign a trophy. 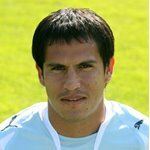 Argentine-born Ledesma acquired Italian citizenship in 2008 through marriage to an Italian woman he met during his spell at Lecce; this made him eligible at international level for both Argentina and the Azzurri, as he had never been capped with the Selección before. On 14 November 2010 Ledesma accepted a call-up by Italy manager Cesare Prandelli for a friendly match against Romania, thus becoming the third oriundo to become part of the Azzurri senior squad in the last ten years, the other two being Mauro Camoranesi and Amauri.